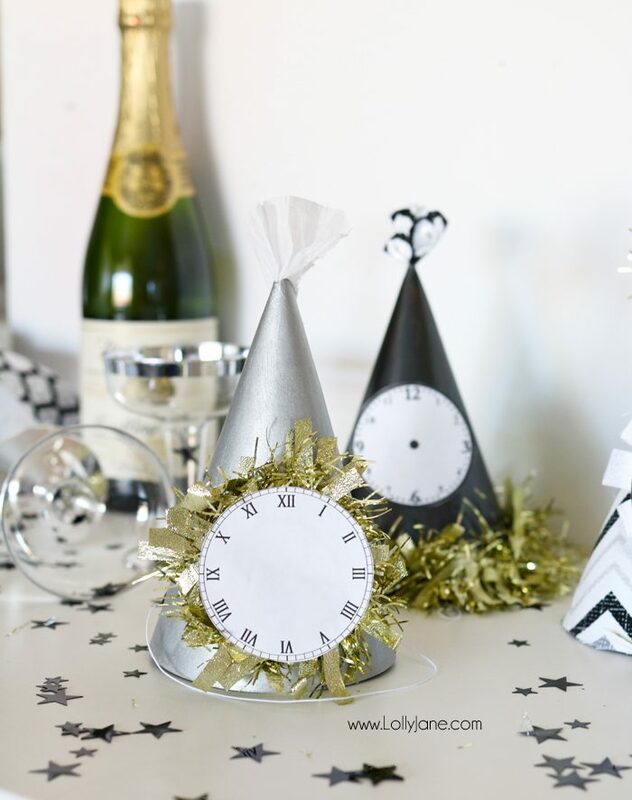 get your DIY on to make these easy NYE party hats, perfect for a new years eve celebration, topped off with a customizable printable clock! The countdown is on… t-minus THIRTEEN days until New Years Eve! Whaaa?! 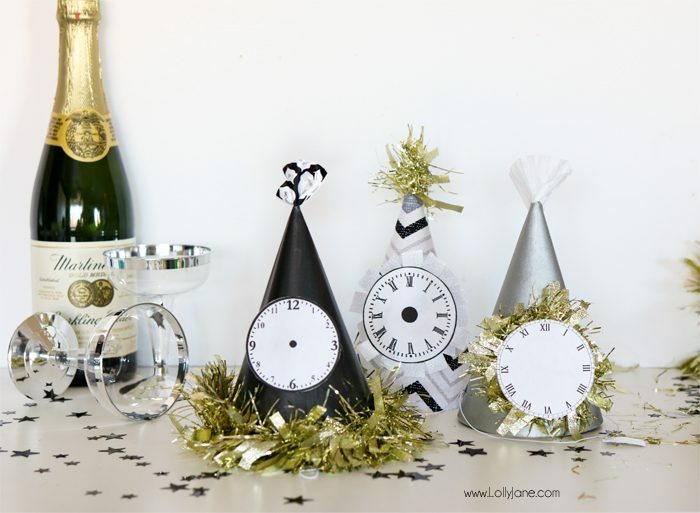 Time flies, of course, so let’s welcome 2019 in style with these easy NYE Party Hats tutorial, blinged out with a free clock printable. 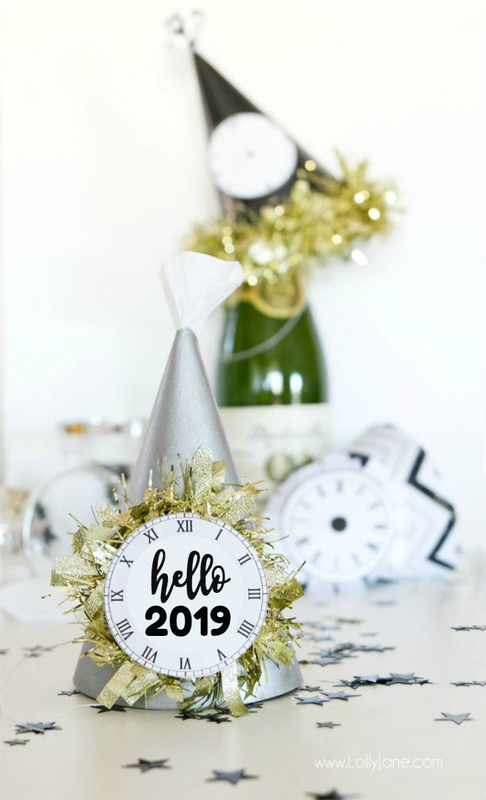 AND… we’re also sharing 11 other fun NYE printables, DIY’s, or drink ideas by our very creative blog friends at the end of the post so be sure to hop on over to see those for major New Years Eve inspo! 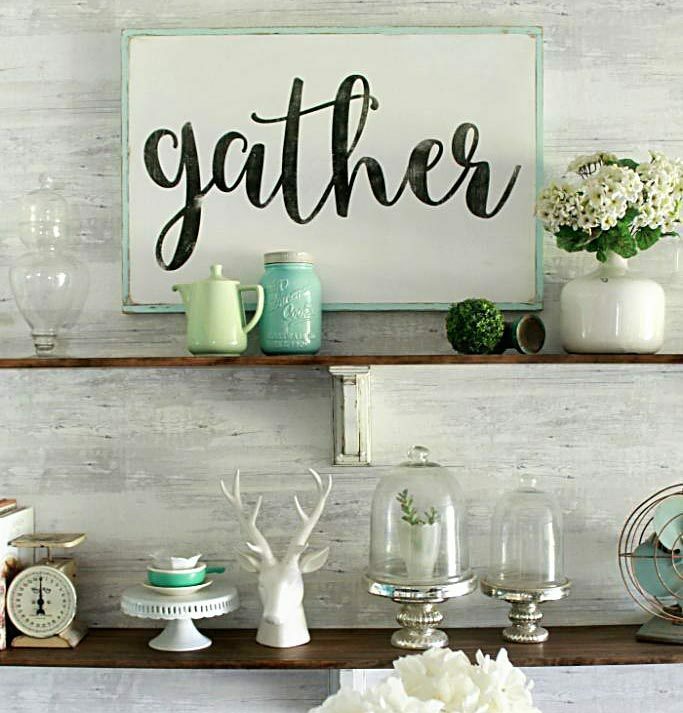 Making these was a cinch and definitely a kid-friendly craft, just be sure to use supervision with the hot glue gun. 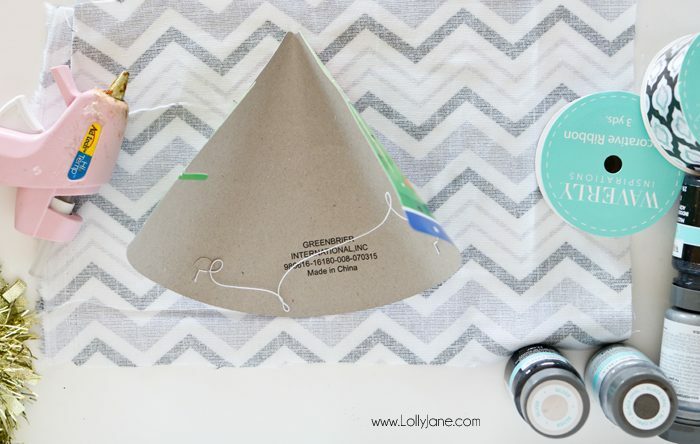 😉 To get started you’ll need to cover up those bright birthday party graphics on the party hats. I painted 2 coats of metallic paint over 2 of them, one in black and one in silver. 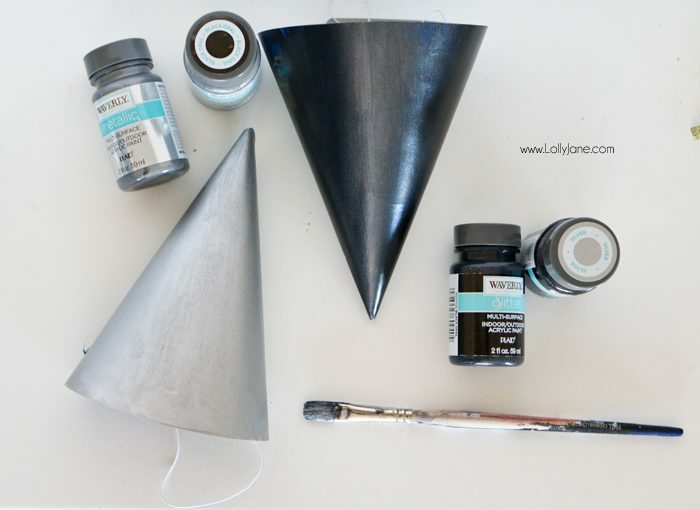 I cut some fabric in a classic chevron pattern, decked out in black & silver, to fit the party hat shape then hot glued it on. I trimmed the excess fabric then glued it together. Cute! I love the texture of the fabric against the metallic hats. 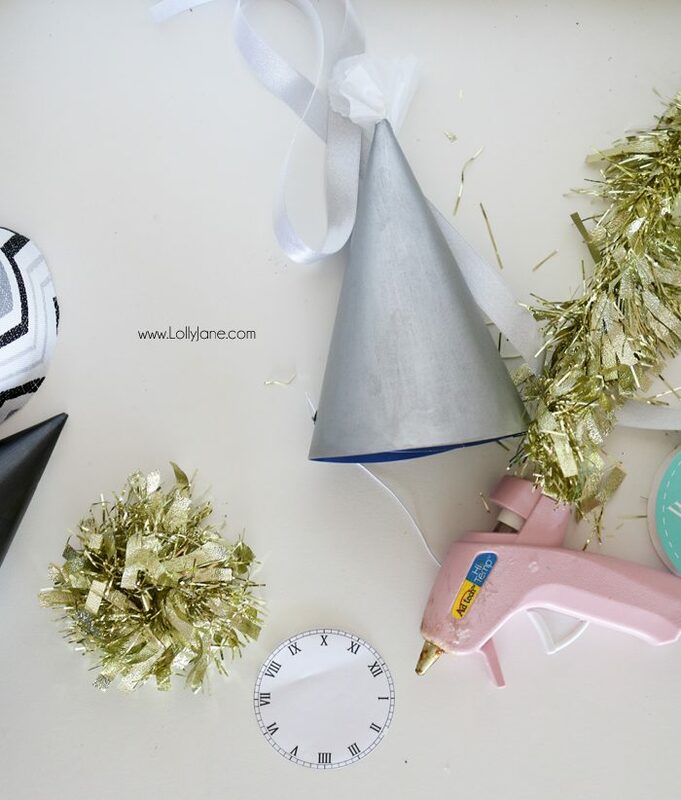 Hot glue the tinsel in a circle then glue a clock to the front of it; lastly, hot glue it to the party hat. I used the streamer as a hat topper and just bunched it together like a ruffle then glued it in place. I love the ribbon that has a bit of sparkle to it so I bunched the patterned one as a topper then used the silver ribbon one to back a clock by adding strips behind it. Easy peasy. 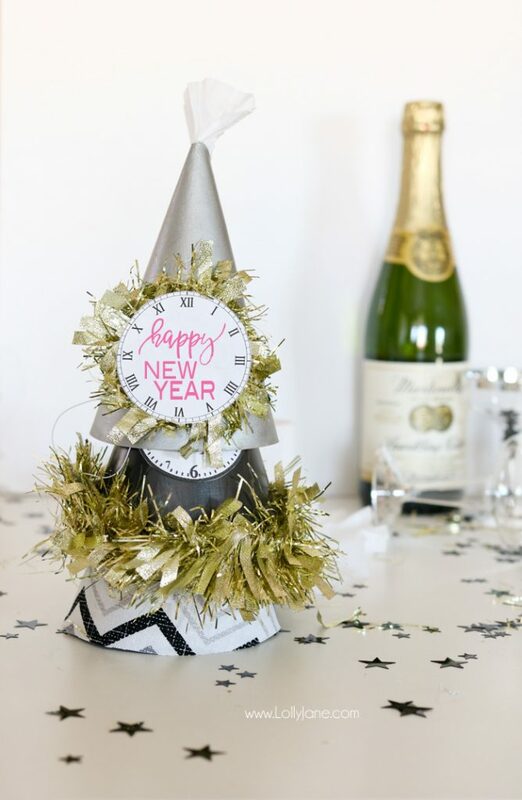 You can mix and match styles and textures of the fabric, ribbon and paint to create some fun and super easy party hats, perfect for NYE! I kind of want to paint everything this pretty metallic silver hue as it’s the perfect shade of gray with a bit of shine! 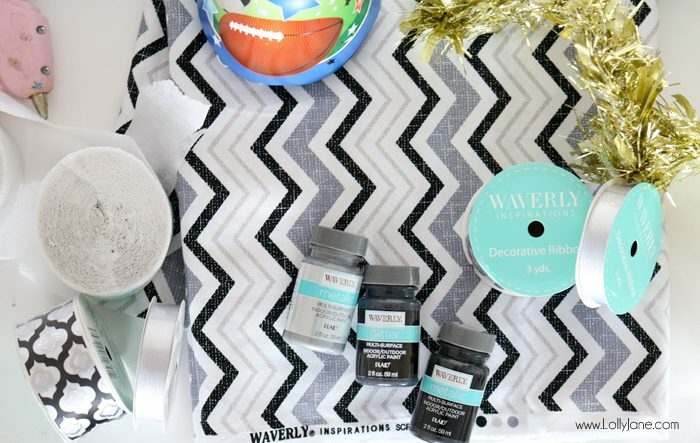 Loving all of the classic blacks, whites, and silvers in the products with the gold tinsel. I can hardly wait to chill our kid-friendly bubbly (Martinelli’s) and watch the ball drop! This post originally published on Lolly Jane in December 2016. 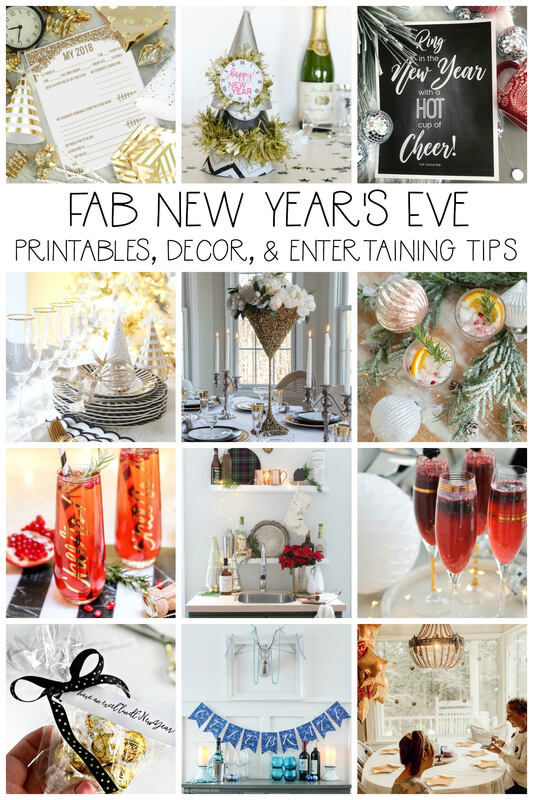 Without further adieu… here are our creative friends sharing their FAB New Year’s Eve Entertaining ideas, recipes, and printables with you, hop on over and be sure to tell them we say hello! So cute! 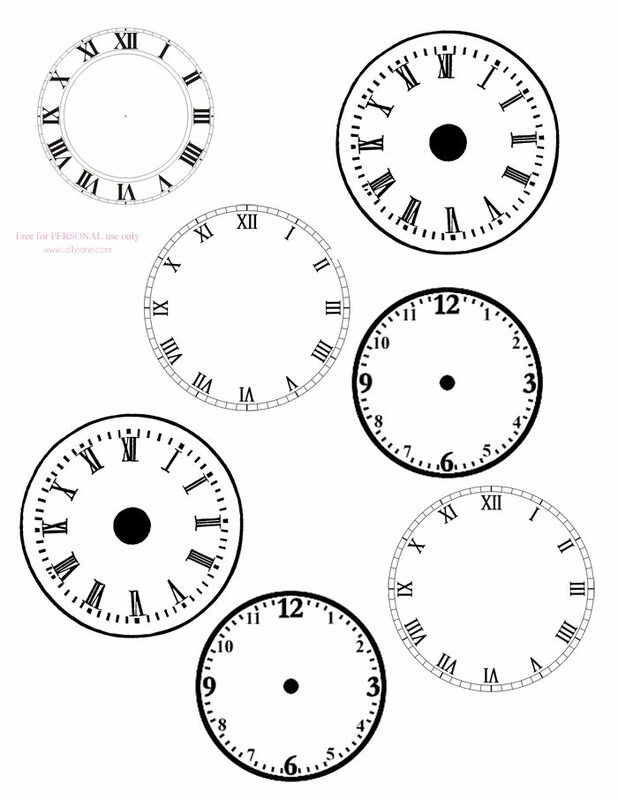 I love doing a clock theme for New Years! I decorated my mantle with clocks a few years ago and it is still one of my favorites. Pinning the print out. Thanks for sharing with SYC. Loving these hats! Thanks so much for sharing this with us at the DI & DI Link Party. Awesome! 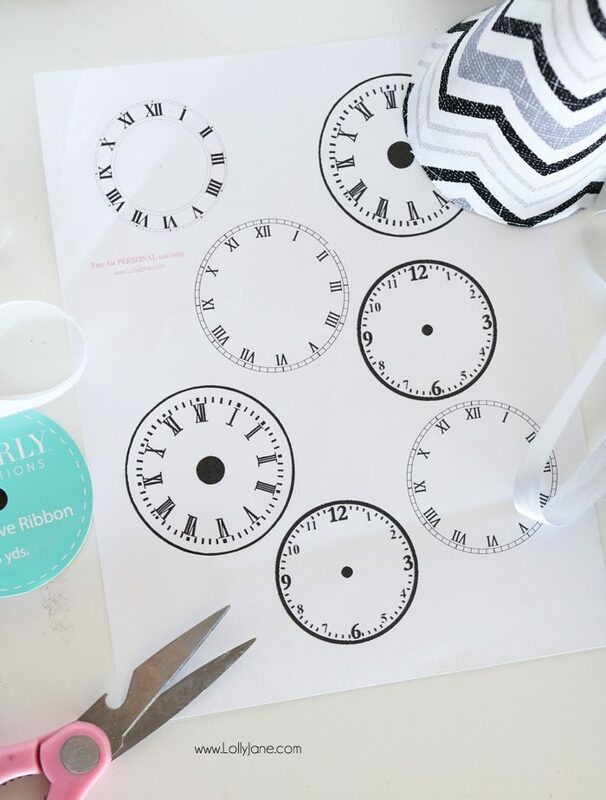 Love anything w/ clocks. Featuring when my party opens tonight. Happy New Year! They are really cute, thank you for sharing! If you can, come and join the Holidays Celebration Link Party (http://keepingitrreal.blogspot.com.es/2016/12/holidays-celebration-link-party-5.html) and bring all your holidays and New Year posts! 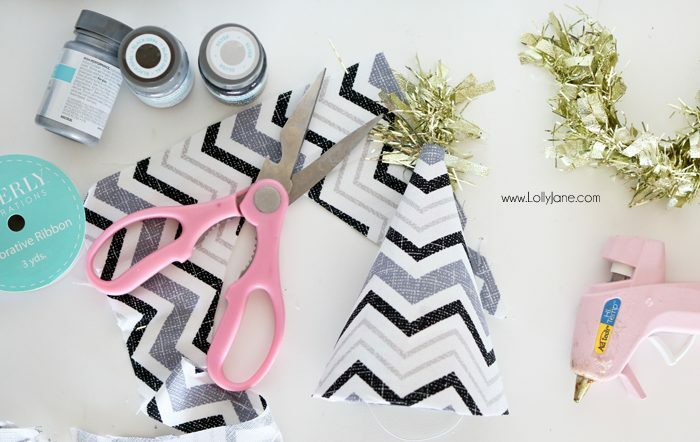 I absolutely adore these party hats! You have been featured this week at Dishing It & Digging It. Thank you so much for sharing with us 🙂 Wishing you a very Happy New Year! Such adorable ideas!!! I love the way the hats came out! Thanks for sharing on Homestead Blog Hop! Such a cute party hat! Happy Holidays girls! I love that party hat! It is perfect for the New Years Eve.Merry Christmas! Those are so festive and easy to make. Thank you for sharing on the blog hop! Happy Holidays! I really can’t believe this year flew by so quickly. I love your party hats.